While I was on retreat in Jan. we decided we needed a sewing day before our next retreat, so planned one for March. We met on Saturday, bright and early and sewed and chatted through the day. Pat had her center all put together for this sampler, but was unhappy about the stripes on her border so spent most of her time recutting them and taking the old ones off. It is so gorgeous! She has the woven border ready to put on, so it's just a matter of time until she has a finish! Diana worked on a Miss Tess baby quilt and brought this one to show us. She also brought her two finished Zigzag quilts...she made these for twins and used the same polka dot fabric for each, coordinating with the pink and purple so they will be able to tell them apart. She also brought her finished Spiderweb Stringpiecing quilt for show and tell. Dianne got her Against the Tide Mystery quilt finished. It's not as light as it appears in this picture, you can see the light from behind showing through. It's hard to get good pictures of larger quilts in the classroom! She also got her border sewn on her Miss Tess quilt. She found a black with small white polka dots that seemed perfect and mirrored the black and white polka dots in the centers of the shapes. Here's a close up so you can see the dots! I worked on my red and white challenge quilt. I like it so far. Awhile back, Carole emailed me from VA that her daughter loved the Circle and Spin quilt she saw on my blog and wanted her to make it for her. I believe it was for a wedding gift. I received an email the other day with a picture of the finished quilt...it's so beautiful! 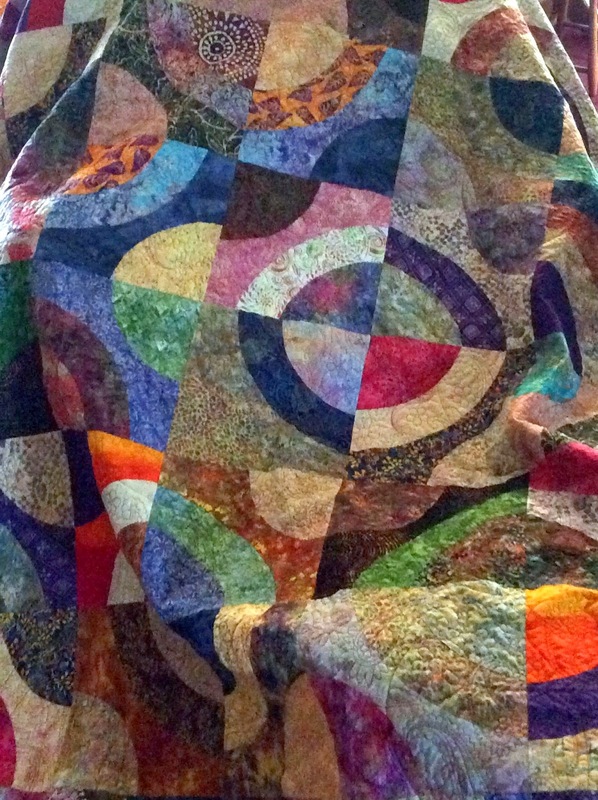 I love it when people send me pix of quilts they've made with my patterns! My daughter and I did a little thrift shop shopping yesterday...she found a rocker/recliner that looks like new so snatched it up after we determined it would fit in her Kia Soul. I didn't find anything, but that's ok since I don't really much at this point. It's always fun looking though! Amazing group you have. You are always having fun. Another great episode of showing and telling. Can you find a way to bottle all that get-up-and-go drive? You'd make a fortune. You're leading a very energetic group who get a lot done. sew togehter is almost just as much fun as a retreat.